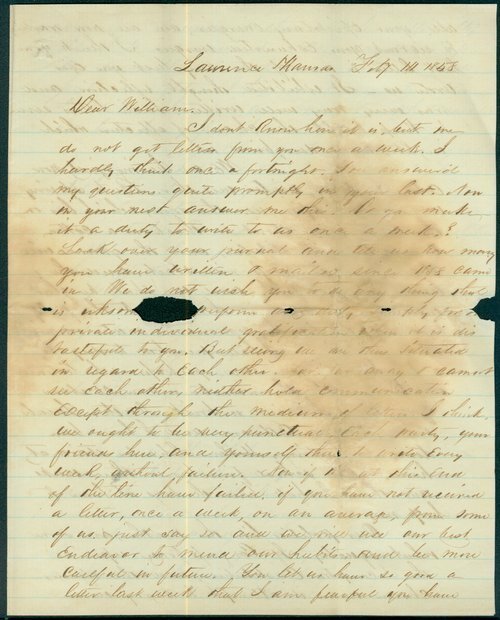 A letter written from Lawrence, Kansas Territory, by John Stillman Brown, addressed to his son, William Brown, who was studying at Phillips Exeter Academy. Brown admonished his son for not writing. He discusses the cold weather and the political conditions in territorial Kansas, including his opposition to the Lecompton Constitution. Brown predicted high immigration to Kansas in the coming spring, and also predicted that "Kansas is sure to be Free" and without any slaves within two years.